Satin is a fabric with high shine and soft feel. To read more on satin and what it is used for please click this link. Satin is a popular fabric known for its high gloss surface and used in everything from shirts and athletic shorts to bed sheets. A traditional hallmark of satin is the fact that the front side is incredibly shiny, while its backside is dull. The discrepancy in appearance is due to the satin weaving technique that allows large runs of thread to continue without being interwoven. Satin is woven using filament fibers like polyester, silk or nylon; while its close cousin sateen makes use of short staple yarns like cotton. 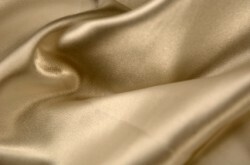 The term satin was first coined in the Middle Ages as a way to describe silk fabrics of high luster. While these original fabrics bear little resemblance to today's satin the name has stuck and isn't going anywhere.